Scratch that...I Want Pig Candy!! I Want Pig Candy is a delectable treat that starts with real Bacon that is slow roasted with brown sugar until it's crispy and crunchy...then basted with hand-crafted glazes made with craft beer, sauces and dry rubs. I Want Pig Candy offers some tasty and unique flavors like Buffalo, Jalapeno Poppers, Teriyaki, Taco, Mango Habanero and Candied Hops, along with classics like Original Brown Sugar. 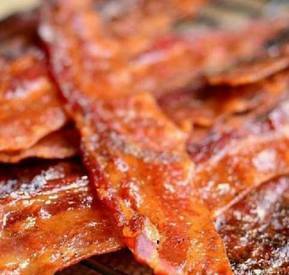 If you like the delightful combination of sweet, salty and delicious...YOU Want Pig Candy! !